This summer I had the chance to speak at the North Central College summer institute for educators. My contention is that using team building and challenge-based activities in the classroom can develop meaningful lessons and lasting impressions. Obviously, we are all unique. Each individual will benefit from differentiation in education to develop knowledge and skills needed to be successful in life. However, if we examine the social-emotional connection of the best and most successful teams in history, whether it be in sports, business, or other avenues of life, we see that a shared teaming experience can prompt better individual production. Instead of using these arbitrary “teams” from human history, let’s best illustrate the above contention by asking you, the reader, to think of the best classroom experience you’ve ever had. What class was it? What grade level? Why was it so memorable? Next, think about the best team you’ve ever been a part of. Was it a sports team? Was it within a job or profession? What did you accomplish? What did you learn? What characteristics made it such a good team? With help from education resources like Bruce Tuckman, Patrick Lencioni, John Persico, and Mark Miller, common descriptors of successful teams include words like respect, support, cooperation, and commitment. Perhaps some of these terms came up in your head as well. There exists a positive attitude for success, and teammates care for one another as they work towards common goals. Therefore, instead of treating a class of students as 30+ individuals, creating a team experience can foster trust, risk taking, decision making, higher-level thinking, and curricular competence. This simply sounds like good teaching. To challenge is to change. To change is to live. So, to encourage positive change is to be an effective educator. Treating your classroom like a cohesive group of teammates is not easy. Particularly difficult is promoting a “buy-in” from adolescents who come to class with varying backgrounds, pre-conceived notions of the course and curriculum, different comfort levels in socialization, etc. Not to mention the stress of each new day. 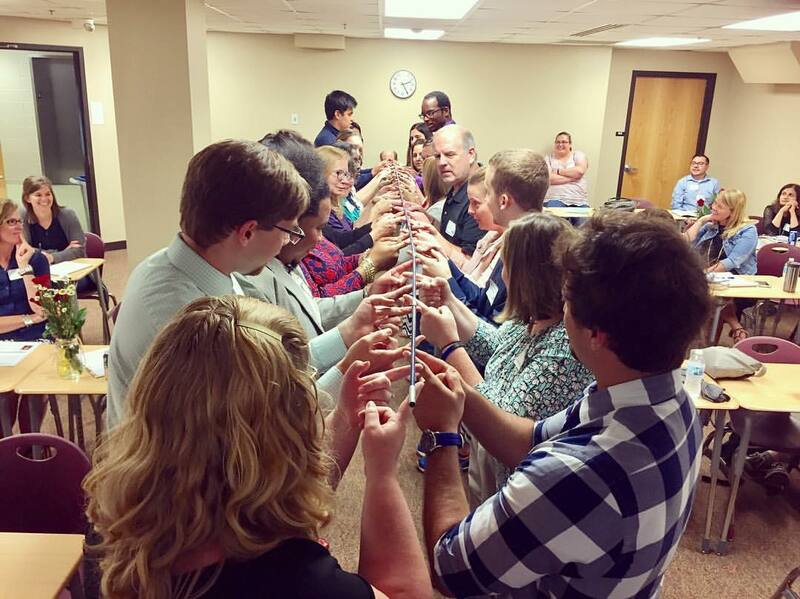 The team building activities can range from simple ice breakers to mentally (and even physically) challenging problem-solving scenarios. These games or activities cause frustration, on purpose, in what we commonly know as a “storming” phase of team development. As students regroup, the potential is set for deeper connections to each other and to class content because answers/conclusions are developed by the group, versus direct instruction in a “sit and get” setting. Let me offer some quick lesson plan write-ups of older teaming activities that may still have use in a group setting. I’ll include more here as I get them on Google Docs. Helium Stick: can the group lower the Helium Stick down to the ground using only fingers? Stepping Stones: can each member make it from one side of the “river” to the other using the stepping stones? Here are some other quick ideas: Wilderdom.com; TeachMeTeamwork.com; TeachThought. Post-activity is the sweet spot for learning. Debriefing provides closure and celebration. It cements the activity in the mind of students, which not only creates deeper meaning, it allows learning to continue outside of the classroom setting. Again, this is the mark of a good teacher. While speaking with North Central pre-service student/educators, the toughest question posed to me was one I still ponder. I’ll leave you with this leading question, and a few follow-ups. How do you create a team environment with students who do not like one another? What team building activities can best build bridge the small social cliques that are embedded in a school? What can be done in a short period of time? How can you build an educational team of students in a semester course? 9 weeks? 4 weeks? Other examples of challenge-based activities are shared on my presentation, as well as throughout the school year on social media. Join the conversation!